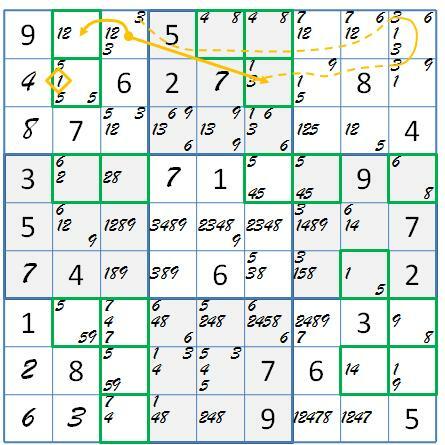 Here we continue with snapshots from the review puzzles from Stephens’ The Sudoku Addict’s Workbook. 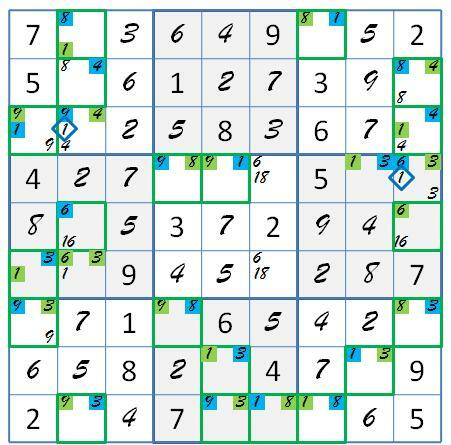 The review covers 10 of 40 “Extreme” puzzles in this and Paul’s Mastering Sudoku Week by Week. 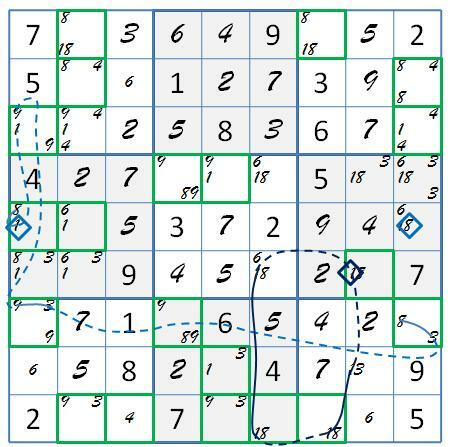 The Extreme collection is highly recommended, even if sysudoku methodology is preferred over Stephens’. The first order of business is the mystery puzzle of the last post. What is going on? It’s Addicts 126. The 136-wing victim “sees” the 36-wing via a forcing chain. Its removal implies SW6 which destroys the UR r29c23. 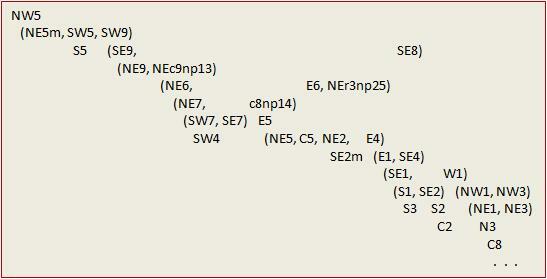 This clue is followed by the XY ANL and 1-chain ANL shown here. Follow up and coloring brings the extension of the single cluster to a wrap, driving two green candidates into cell r6c2 and confirming blue. That also wraps up Addicts 126. Next in the spotlight is Addicts 134. This one stubbornly resists a single clue in box marking, which must be pretty discouraging in Stephens basic. Then it makes up for it with a naked triple and two naked singles. My favorite part is the rare forcing chained together XYZ-wing that devastates the puzzle. You might have thought that the X and Y wing candidates of the XYZ wing must be in a unit with their partners in the hinge, but the fact is, “seeing” their hinge partners by any means is good enough. In this case, one wing is glued on with a forcing chain. This Frankenstein 123-wing that easily removes the victim. If you need a trace to see how the removal collapses Addicts 134, I’ve got one for you. Catch your breath. Addicts 138 is another joy ride. The party starts with a wild XY-chain, and continues with a finned 1-wing. Then a simple 3-chain removes the 3-candidate in r7c7. You could follow up on these removals to find that one. I’ll save it for the next post. Or you can work back from the next grid coming next week in the third and last of the Extreme snaps posts. It is a Medusa coloring of particular interest. 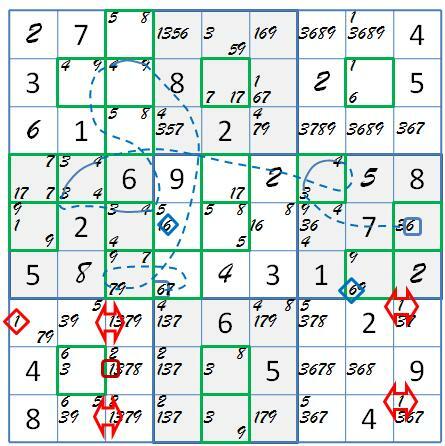 This entry was posted in Advanced Solving, Puzzle Reviews and tagged almost nice loop, ER XYZ-wing, finned X-wing, Medusa coloring, Paul Stephens. Bookmark the permalink.